This quick and easy bruschetta mix blends fresh tomatoes, balsamic vinegar, olive oil and herbs and spices. Substitute canned diced tomatoes for a simple alternative. Serve on toasted baguette slices with shredded Parmesan cheese for a savory appetizer. Wash fresh tomatoes. Scald for 3 minutes in boiling water. Dip into cold water. Cut out cores, remove skins and chop coarsely. Drain and discard liquid. This should yield about three cups tomatoes. If using canned tomatoes, drain liquid. 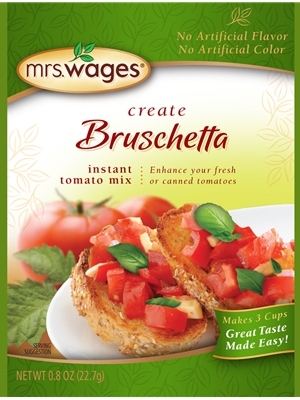 Combine tomatoes, balsamic vinegar, olive oil, and Mrs. Wages Bruschetta Seasonging Mix in a medium bowl. Serve it! Cover and refrigerate at least 30 minutes before serving. Store covered in refrigerator up to 1 week.